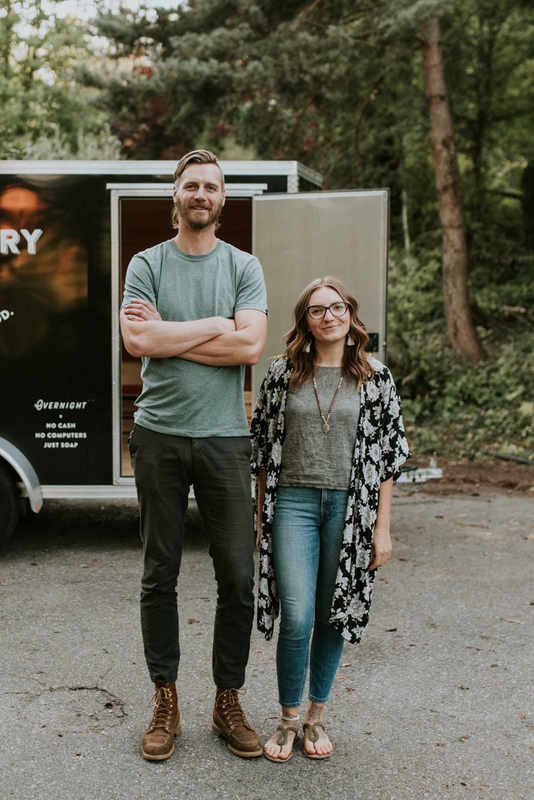 Nate Lepp and Erika Arnold are the visionaries behind The Refillery, a black mobile trailer filled with bulk soaps and other goods. All for the purpose of encouraging a zero waste lifestyle. Often parked behind Mt. Waddington’s Outdoors or at various local markets, it can also be found deep in the mountains of Chilliwack in the driveway of Nate’s home. After a scenic drive of the Chilliwack backroads, we arrived at Nate’s. Surrounded by beautiful trees, gorgeous sunlight rays and a small orchard in the backyard, we instantly knew this was the perfect backdrop for sharing their story. TFV: What is the story of how you two started The Refillery? 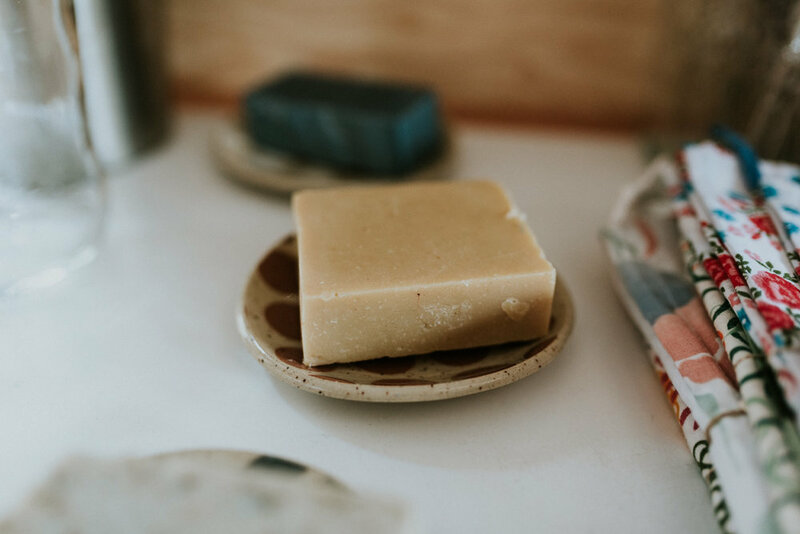 NL: After refilling at The Soap Dispensary while living in Vancouver, I moved to Chilliwack and was thinking of business ideas connected with what I value. In July 2017, I contacted Linh, the Soap Dispensary owner, to pick her brain a bit. She told me that Erika had called her the same week, and suggested we see if there might be a partnership opportunity. 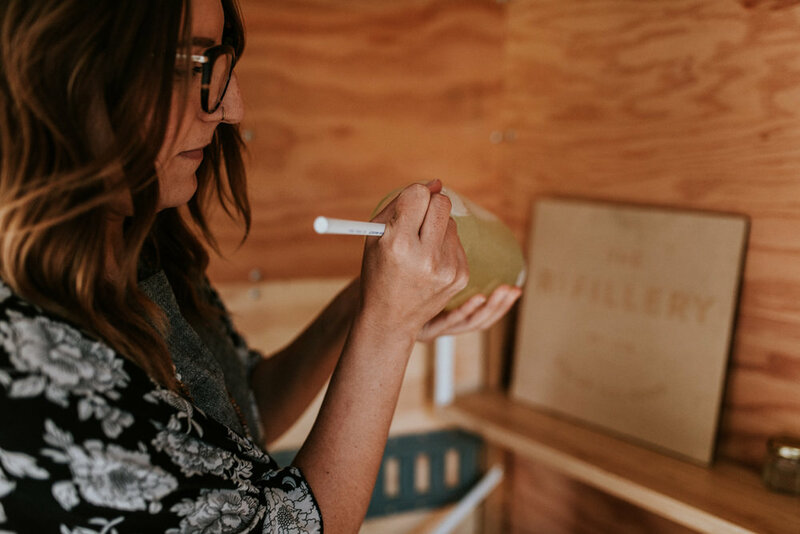 It took us a while to connect, but we did, and decided it made the most sense to combine our skills and gifts in a shared business effort. EA: I think for both of us the story is a little bit different. But essentially we both had the same idea and after a few meetings, thought, and consideration we thought it would be a good partnership. Starting a zero waste store was something I always hoped would be a future goal of mine but at the time wasn't to worried about it since I was in school. It just so happened that as I was investigating and doing research, Nate was doing the same and we happened to call The Soap Dispensary both within a few days of each other, so once the owner, as well as one of our mutual friends told us we should connect, all the planning started happening. TFV: What was the reasoning being your decision to move into a more zero waste lifestyle? NL: I value nature and wilderness deeply, and a significant part of my motivation is protection of the environment. 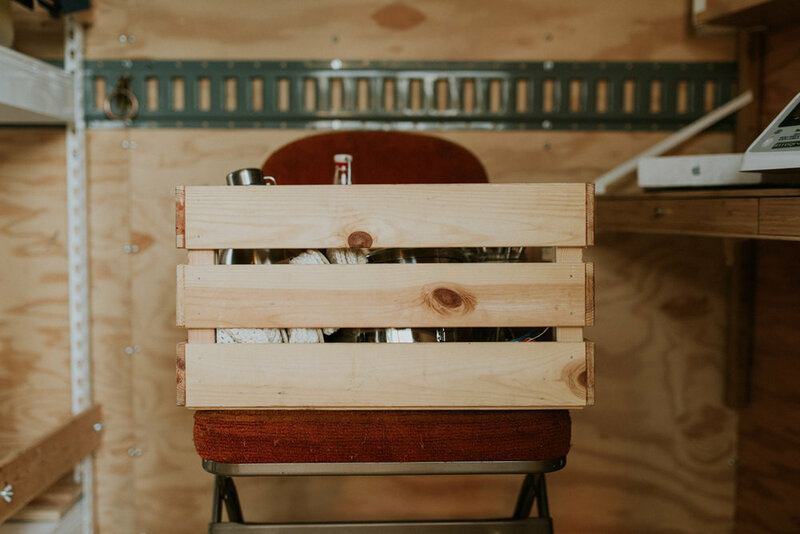 But, I’m also drawn to the act of reusing and refilling as an act of restoration and redemption, taking something that would otherwise be unwanted or discarded and showing that it still has worth and value. EA: I have always considered myself a fairy environmentally conscious person. I grew up with my parents gardening and being conscious of recycling and composting as well as became a vegetarian and then a vegan at a young age. But I really didn’t know all the extra things I could do that actually make a big difference. I began dabbling in the world of zero waste after seeing a video of Lauren Singer (the girl who fit all of her garbage from a year in a mason jar) and I thought hey, I think I can do that! So I started saying no to single use plastics and making small switches. It wasn't until after a trip to Costa Rica that I began to notice the magnitude of plastic pollution taking over. When I returned home from my trip I started to notice it even more in our own backyard, as trash can be sighted around the lakes, rivers, and mountains. It was then I decided to dive deeper, find more information and resources on information of how big of a problem it was really becoming. I started purchasing nuts, seeds, grains, and anything else I could in bulk, getting items refilled like shampoo, household cleaners, soaps, and even foods and started to volunteer for different clean ups. We are so lucky to live in a town like Chilliwack, that has so many great resources for locally sourced foods that can be purchased package free. From there it just became a habit and exciting to try and reduce as much waste as I could, that it also became a platform for me to educate others just from being asked questions of how or why I did certain things. TFV: If someone is looking to cut down on their waste, what are some simple things they can do to start? NL: Refill at The Refillery! The products we sell are the easiest to get started with. 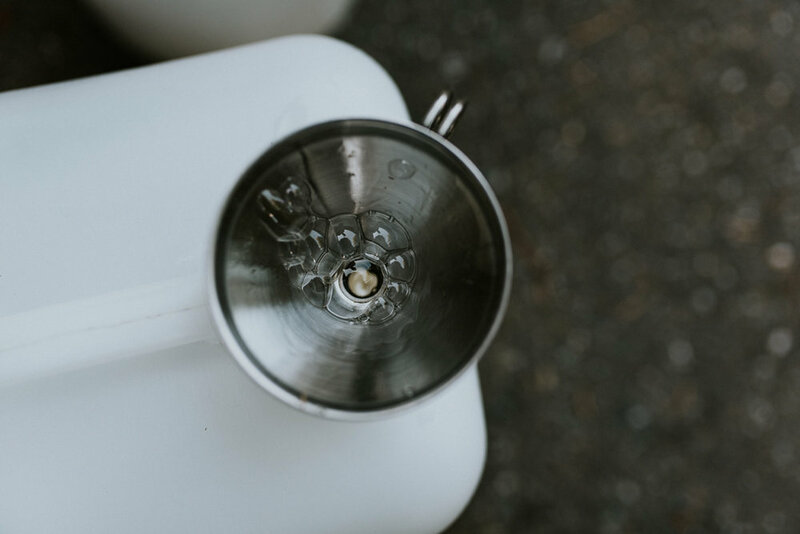 You’ve likely already got the containers you need at home, and these are products you use every day so you’ll have an immediate and meaningful impact on the local waste cycle. EA: I always stay start small, if you try and do a complete overhaul and everting all at once it can feel really daunting and in some way or another easier to give up. Start by saying goodbye to single use plastics and disposable items by having a kit you can bring with you that might have a reusable mug and water bottle, reusable fabric bags for bulk items or produce, bamboo cutlery, and a small container for leftover or for something to go from restaurants. 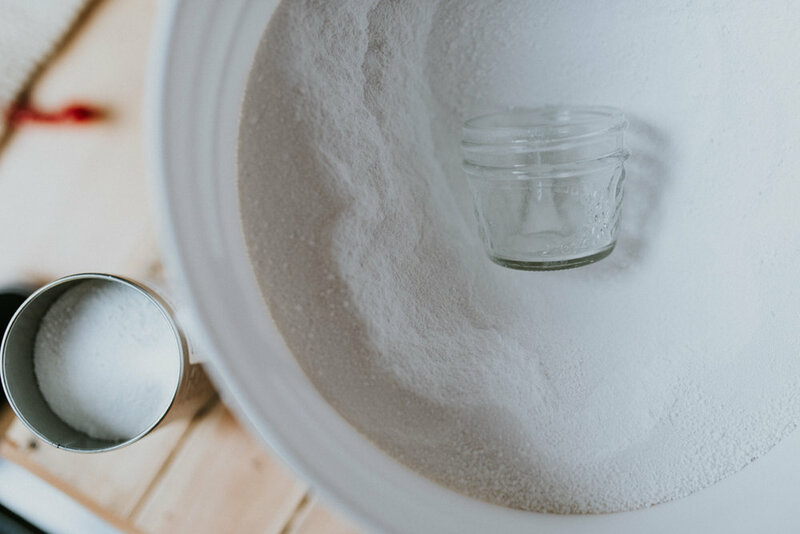 From there as your start needing to replace products or as you grocery shop just choose options without packaging and get items refilled in your own jars or reused containers. It came seem hard to know where to start at first but really it is all about changing habits and it becomes just as easy and if anything a little more fun and exciting. We have a blog on our website about Breaking Down the 5 “R’s” with a few more ways to start! TFV: What products do you offer? EA: We offer a number of various locally made, eco friendly, all natural, products that you bring in your own containers to be filled and we charge by weight. We have body care products like moisturizer, shampoo, conditioner, body wash and package free bar soap. Household cleaners and soap; laundry, dish, hand, dishwasher, and all purpose cleaners in different scents, as well as unscented options. And then we also carry some small accessories to help you reduce your waste and single use items like stainless steel straws, beeswax wraps, bamboo cutlery and toothbrushes, small fabric bags, and stainless steel containers. TFV: Where can people find The Refillery? EA: You can find us most often parked behind Mt. Waddington's Outdoors. We also go to local markets and events like the Abbotsford Valley Food and Farm Market and the Yarrow Market in the summer months. We always post on social media where you can find us for the week and if we have any new locations! TFV: What made you decide to use a trailer as your means of business? NL: We had a very small capacity for an initial capital investment, so we needed a retail space solution that was inexpensive and flexible. My dad wasn’t using the trailer, and was generous enough to lend it to us. A few modifications and it was ready to go. 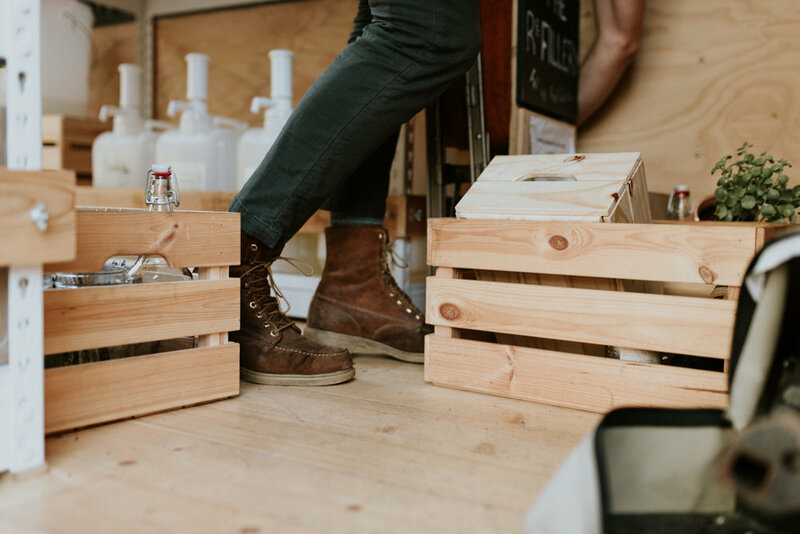 Being mobile means we can set up at a semi-permanent location, but still also do local markets and pop-ups to grow our customer base. It also means we can start out with part-time retail hours to grow the business bit by bit while we work in other roles at local small businesses we are also passionate about. EA: It was just an opportunity we couldn't pass up! 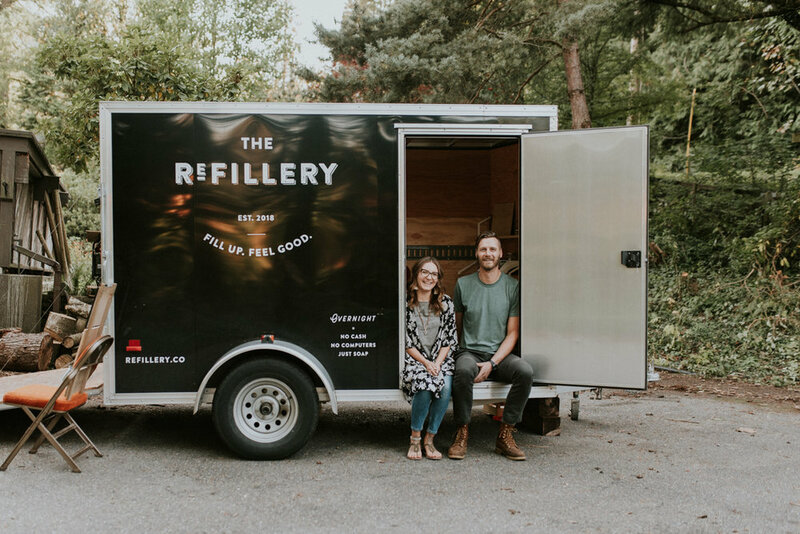 In the early stages of planning The Refillery we had the idea of being mobile and were trying to think of ways to make it work and luckily enough we were able to borrow the trailer and its been a great way to start. TFV: Wine or beer? Road trip or staycation? Ocean or mountains? Spring or fall? NL: I don’t drink much other than water. Backpacking trip. Ocean and mountains. Fall. EA: Beer. Road Trip. Ocean. Fall. TFV: Can you tell us a little bit about your lives outside of The Refillery? NL: I live on a shared property with another family in Ryder Lake. Reading and recreating outside are how I spend much of my time outside of work. I’m also the general manager at Mt. Waddington’s Outdoors, where I get to be part of an awesome team that helps folks get equipped for enjoying our beautiful wilderness backyard. EA: Outside of The Refillery I am also a yoga teacher and the manager at Studio B Yoga & More. 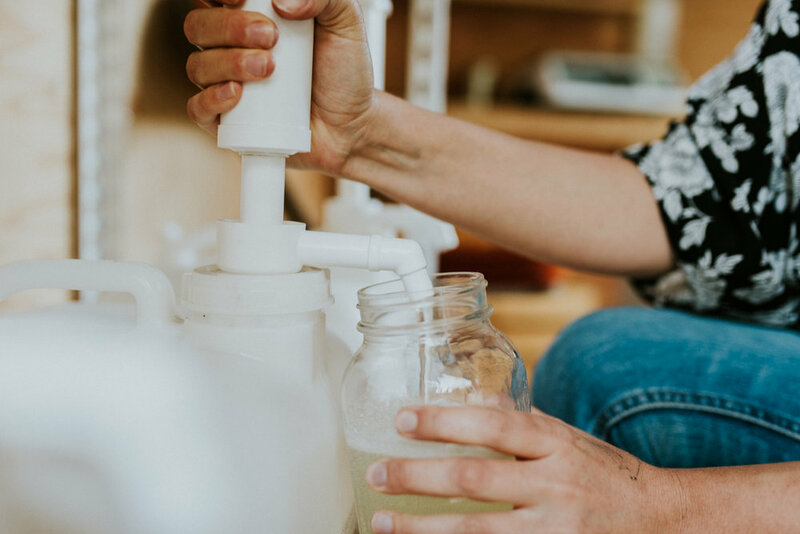 This past August, I graduated from the Canadian School of Natural Nutrition and am a Register Holistic Nutritionist and have a huge passion for local, seasonal, and sustainable food sources. I love exploring the beautiful Fraser Valley hiking and paddle boarding whenever I get the chance. NL: Spend less energy trying to line up your vocation with all those external expectations and pressures, listen instead for the deeper desires and values that show up as guiding threads in your life’s story. EA: Oh gosh thats a tough one… I even think of all the things I wish I could tell myself from a year ago! But over all I really think I would remind myself to trust the process and that everything is a step that leads you in the right direction. I wouldn’t be where I am today and the Refillery probably wouldn’t even be a thought in my mind if I didn’t let my journey take me here. I would also say to stay passionate about the things that truly matter to you. When I started this journey into living more mindfully it seemed like the last thing on many peoples radars and now the importance of reduce our impacts on the planet are talked about worldwide. TFV: Who are some of your favourite locals and businesses from the Fraser Valley to follow on social media? NL: I don’t follow social media! EA: A long list! 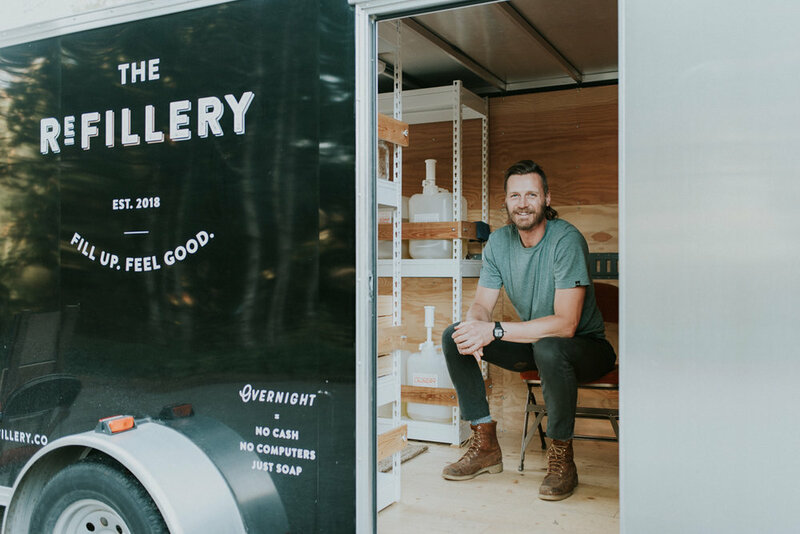 I really love following local artist, creator and small businesses of all kinds growing the culture and community in the Fraser Valley. TFV: Where does each of you call home in the Fraser Valley? NL: Home is in Ryder Lake, southeast of Chilliwack. EA: I live in Sardis! TFV: If you could recommend one place in the Fraser Valley, what would it be? Why? NL: The Chilliwack River Valley, for hikes to gorgeous lakes and mountain tops with stunning views – all without the crowds of other Lower Mainland mountain playgrounds. EA: I honestly don't think I can pick one place! I feel so incredibly lucky to live in the valley and be surrounded by so much beauty and so close to so many mountains and lakes. NL: A desert slot canyon. EA: Tofino. The Ocean, the views, surfing, small town vibes, small businesses, and of course the famous tacos. Before this business venture, Nate and Erica were strangers with a common goal and by the hand of a mutual friend, The Refillery came to be. They make the perfect team and we couldn’t be more excited to see the effect they have on waste in our community.